Immuno-oncology has recently been characterized by one leading investor as a “Strategic Supernova”1. The associated excitement is well-supported by clinical trial data for some of the 70 or so clinical and preclinical programs targeting the PD-1/PD-L1 axis alone, across over 500 open clinical trials1. However, it is also evident that the abundance of developmental compounds will face considerable differentiation and cost-effectiveness challenges in global markets, a fact recently highlighted by Richard Padzur, M.D., acting director, Oncology Center of Excellence at the FDA2. Successful development and implementation of companion/complementary diagnostic strategies will likely mark the difference between winners and losers in this crowded space. A key 2016 report3 sponsored by BIO quantified an increase from 8.4% to 25.9% in likelihood of successful transition from Phase I to ultimate FDA approval resulting from a targeted development approach. Inclusion of a biomarker may not in itself completely address the differentiation challenge, however, as Bristol-Myers Squibb (BMS) found when the Checkmate 026 1st line NSCLC trial failed to meet its primary endpoint for its Opdivo therapy. In this scenario, the low (5%) cut-off of the PD-L1 biomarker, which resulted in the inclusion of 78% of patients in the trial, appeared to provide insufficient enrichment. By contrast, Merck had previously reported Keynote 024 trial success of its Keytruda therapy in the same (1st line NSCLC) setting using a (different) PD-L1 test which selected only 30% of patients using 50% stained cells as a cut-off. Release of the BMS trial data in August resulted in nearly $20 billion of market value changing hands, in what might be considered a value inflection point for the broader field of precision medicine. Meeting the regulatory bar will not suffice in an increasingly cost-constrained world. Indeed, the U.K.’s National Institute of Health and Care Excellence (NICE) highlighted the lack of cost-effectiveness of Opdivo in the unstratified 2nd line NSCLC setting in its October negative draft guidance4—despite previous approvals by regulators for use of the drug in this setting. Within the same draft guidance, NICE invited the company to submit additional evidence in biomarker-positive (PD-L1 >10%) patients, with potential interim coverage being provided under the new managed access Cancer Drug Fund mechanism. This proposed path would offer the potential for full-market access within two years in a biomarker-defined subset representing about one-third of the population. Adoption of such criteria is likely to become increasingly common globally, especially in more competitive 1st-line settings. In common with targeted therapy, precision immuno-oncology to-date has largely been defined in terms of patient selection based on the level of activation of the target axis, in this case PD-1/PD-L1. While a target-expression based strategy offers near-terms gains, as evidenced by the 1st line metastatic NSCLC example cited earlier, it represents merely the tip of the iceberg in terms of the broader immuno-biology which dictates patient response to checkpoint-, CAR-T, and vaccine-based therapies, especially as such therapies are increasingly used in multi-mechanism combinations5. The broader topic of precision strategies to capture immune recognition, activation and infiltration is deferred to a future article by the authors. Since there are clearly further gains to be realized from optimization of the PD-1/PD-L1 testing strategies in use today, the remainder of this article will focus on such. As noted previously, various PD-L1 testing strategies have been deployed for different agents and disease settings. Tests leveraging different antibodies with PD-L1 cut-offs ranging from 1–50% have been used for the leading agents in use and development today. Further, the FDA has even created the new category of complementary tests to reflect scenarios in which response enrichment is seen in the biomarker positive population, but where some response also occurs in the biomarker negative population. Such a complementary testing scenario, reflecting the complex biology of the cancer immunity cycle and the imperfect PD-1/PD-L1 testing found in the real world, is likely to become increasingly common in this checkpoint segment and in other areas. Complementary tests today are still regulated as PMAs by the FDA, but could conceivably be regulated differently going forward and treated as part of the baseline testing continuum, much like the G551D genetic testing used for Kalydeco™ selection in cystic fibrosis, where there was technically no FDA-regulated companion test. Going forward, learned societies and payers may go beyond the label to dictate biomarker-defined prescription limits, as illustrated by the NICE NSCLC example referenced earlier. Implementation of PD-1/PD-L1 testing has challenged the regulatory and clinical community, as stakeholders struggle to reconcile different testing strategies. The ongoing FDA Blueprint initiative has attempted to address disparities associated with different assays and cut-off points, so far with only partial success. Going forward, test and drug co-developers will need to work hard to develop comprehensive precision medicine strategies to address some of the commercial and technical disconnects. Absent such careful strategic planning and associated execution, the significant efforts spent by the pharmaceutical industry toward increasing the probability of success in drug development may not only be in vain, but may even lead to further declines in currently low success rates. As pharmaceutical companies build their precision medicine strategies, they need to be mindful of some important challenges to be overcome. These include the big disconnect between the pharma and diagnostic industries, misalignment between stakeholders within pharma organizations, incomplete understanding of biology, intra-tumor heterogeneity, pre-analytical issues, and other analytical variables6,7. In this remainder of this article, we will illustrate these challenges by touching on two such factors. Specifically, we will consider the impact of intra-tumor heterogeneity and subjectivity in scoring IHC results for cMET and PD-L1. Of the 31 up-to-date, FDA-approved CDx and 2 complementary tests, 13 are immunohistochemistry (IHC)-based and 9 are in-situ hybridization (ISH)-based tests which require microscopic examination of stained tissue sections. In one illustrative clinical trial using cMET by IHC as a biomarker with cut-off defined as 50% stained cells at 2+/3+, duplicates slides from 23 NSCLC patients were stained and scored by a pathologist in a blind fashion6,7. Of these patient samples, 17 samples were scored as positive or negative on both slides (concordant) but 6 (26.1%) were discordant, with discrepancies as significant as one slide being scored 0% and its duplicate slide being scored at 100% 2+/3+. 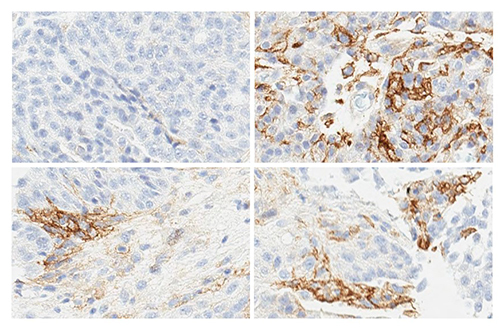 In another illustrative example6,7, the image below shows how heterogeneous PD-L1 staining can be not only in different sections from a tumor, but also in different areas within the same section. In this example, an ovarian sample was stained by an FDA-approved test and scored by a pathologist as 5% of 1+. By examining different areas under the microscope, as shown by this snapshot, it is evident that the sample could alternatively be scored anywhere between 0% to more than 50% stained cells. Such observations, which are very common in IHC, raise fundamental questions including which samples can be considered positive, how much target expression can be enough for a drug interaction, how much positivity can predict clinical response, and whether heterogeneously target-expressing cell populations represent different loci which can be enriched and evolve to drug-resistant tumors. Translational and precision medicine teams within pharmaceutical companies need to address such variables to drive successful outcomes. The early examples of checkpoint inhibitor success offer great hope to the clinical and biotechnology communities. Realizing the huge promise of the broader immuno-oncology field will require careful strategic planning and implementation of precision medicine strategies. Halim AB: Companion Diagnostics Some imminent but overlooked preanalytical and analytical challenges currently facing biomarkers and companion diagnostics. Ann. N.Y. Acad. Sci., 1346(1):63-70 (2015). Iain Miller, Ph.D., is the founder and CEO of Healthcare Strategies Group. Abdel Halim, Ph.D., is vp of translational medicine, biomarkers, and diagnostics at Celldex Therapeutics.